Here’s what we’ve been busy working on . . . In addition to programming from our 50+ participating venues, each year Capture does its own programming with a number of partners. We’ve selected five upcoming Capture-produced exhibitions and events to highlight, so festivalgoers can get as excited about them as we are. Why we’re excited: Have you seen the list of exhibiting artists? Not to mention our highly impressive partners and curator. Capture is very excited to present Images That Speak, this year’s feature exhibition, co-produced with Presentation House Gallery, in partnership with Satellite Gallery. Curated by Christopher Eamon, this group exhibition features the most innovative approaches to photography today, with several works created specially for the occasion. 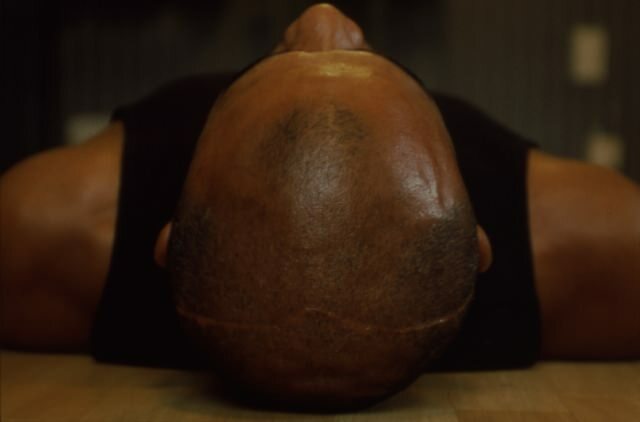 At the heart of Images that Speak is a single slide and audio piece by the celebrated British artist (and Academy Award-winning director) Steve McQueen, entitled 7th November (2001): a close-up view of the top of a man’s shaved and scarred head is intensified by a first-person account of a violent incident involving the police, a fired gun, and a tragic outcome. All of the exhibiting artists share an expanded notion of the “photographic,” leading to experiments that mess with the medium’s traditional depictive realism. They each employ various techniques to tear away the legibility of images, playing with pictorial conventions and adding their own meanings in the process. Why we’re excited: Up-and-comer Jessica Eaton has created a new public work, just for Capture. 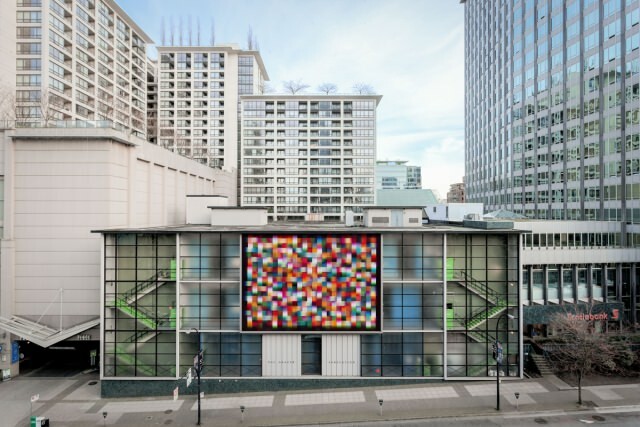 Capture commissioned Canadian photographer Jessica Eaton to create a site-specific work for the exterior of the BC Hydro Dal Grauer Substation on Burrard Street—and it’s going to be a stunning addition to the Downtown Vancouver neighbourhood for the next several months. The Substation, designed by Ned Pratt and B. C. Binning and completed in 1954, embodies West Coast modernist design. Eaton has taken this history as inspiration for her large-scale photograph. Though she creates intensely coloured final images, Eaton actually shoots on black-and-white film, using analog photo techniques, such as multiple exposures and photo filters, to “mix” light directly inside the camera. Riffing on the theme “the city before the city,” artists have contributed lens-based artwork for installation in eight Canada Line stations: Waterfront, City Centre, Olympic Village, City Hall, King Edward, Langara, Marine Drive, and YVR. The project grew out of the exhibition c̓әsnaʔәm, the city before the city, currently showing at the Museum of Anthropology, the Museum of Vancouver (MOV), and the Musqueam Cultural Education Resource Centre, which explores the history of the Musqueam land the current city of Vancouver sits on. But one of the many amazing installations is Dana Claxton’s work for City Centre Station. Elk for c̓əsnaʔəm considers the precolonial landscape of the Lower Mainland—in particular the abundance of elk that once thrived here and still make up an essential part of Musqueam society. Her work asks us to question how we treat the “four-leggeds” among us today, presenting a Technicolor elk in the heart of the city, in a spot where it may once have really stood. This project is partnership between Capture Photography Festival, the Museum of Anthropology at UBC, the Museum of Vancouver, and the Musqueam Cultural Education Resource Centre. 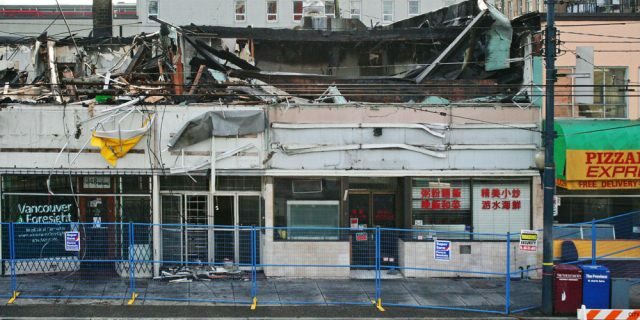 On Christmas morning 2009, a mysterious fire struck a building in the Main Street area, destroying the premises of several local businesses and artist studios. Other Sights for Artists’ Projects revisit this recent historical event alongside the Great Fire of 1886 (which led to the development of Mount Pleasant itself) in their Monument to Mysterious Fires. Comprised of two double-sided billboards, this public installation reflects on the transformation of a city that is constantly changing its architectural landscape. The installation site—a parking lot at Quebec Street and East 6th Avenue—will also be the venue for Other Sights and Capture’s joint Tailgate Party. Going off on Saturday, April 18, it’s an afternoon event for all the family, with photography activities, live entertainment, food trucks, and a beer garden from local brewer 33 Acres. Capture and Cinematheque present this special pAll Usersrogram of two celebrated 1960s films: Michael Snow‘s Wavelength and Michelangelo Antonioni’s Blow-Up. Canadian artist Snow’s work is a decidedly challenging exercise in “structural film,” consisting of almost no action and a single 45-minute zoom shot. 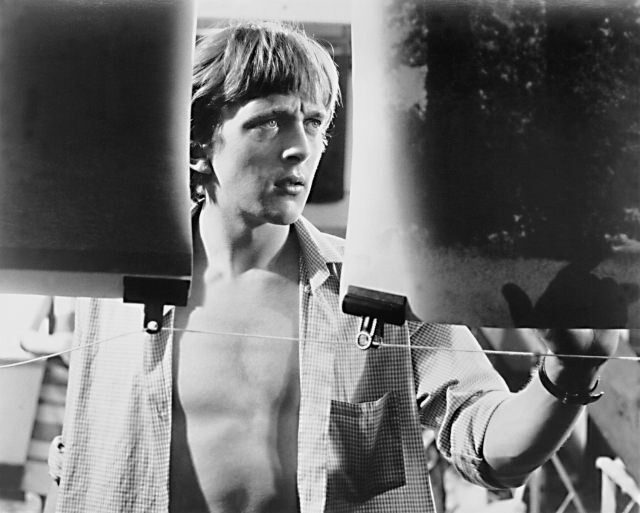 Antonioni’s Blow-up, for which he won the Best Director Academy Award, swings in the opposite direction, following the exploits of a hedonistic photographer who accidentally captures a murder in one of his shots. Both films are considered landmark moments in avant-garde film, asking us to consider what is “beyond” the singular moment depicted in a photograph.